I have been very busy this month preparing to attend Burning Man with one of my college buddies next week. Burning Man is a week-long festival that defies description out in the middle of the Nevada desert, with no power, no water, and no shade. 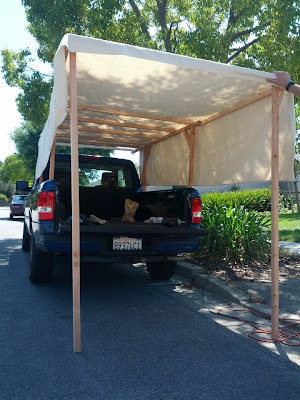 For our camp, in addition to a small tent for sleeping, we decided to build a roof over the bed of my pickup for more shaded living and working area. 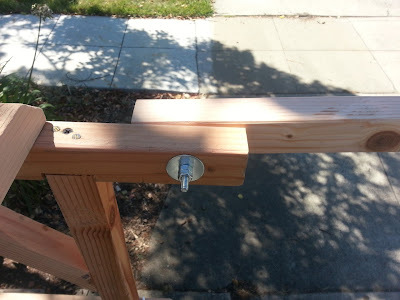 It has been coming together surprisingly well for something that we're just eye-balling and hacking together as we go. 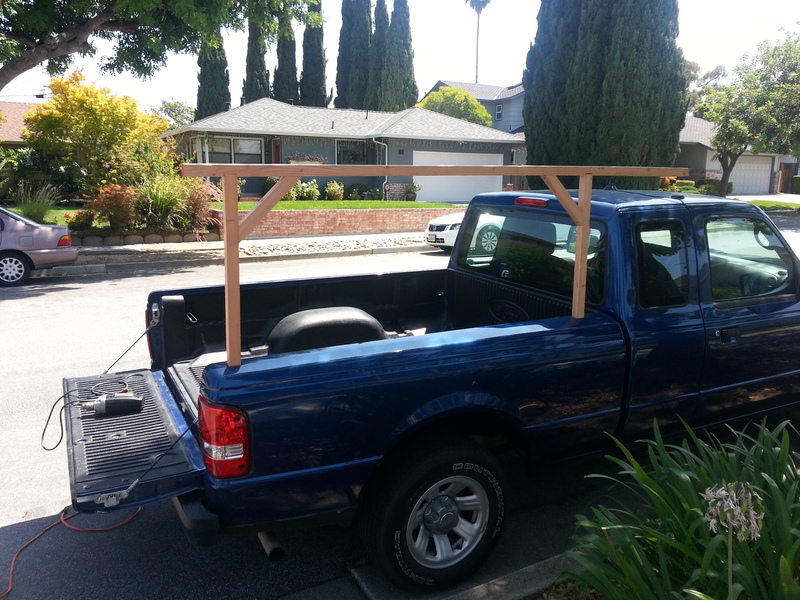 The structure is based around this basic frame built of 2x4s ripped in half length-wise and mounted in the four post holes at the corners of my pickup's bed. Here I am screwing down the cross-beams between the two basic side frames. We used three 2x4s, again ripped in half, so we had six 2x2 (1.25"x1.75"). We made bevel cuts on the top corners of the cross-beams to reduce the chance of ripping the top covering and as part of our aesthetic goal. 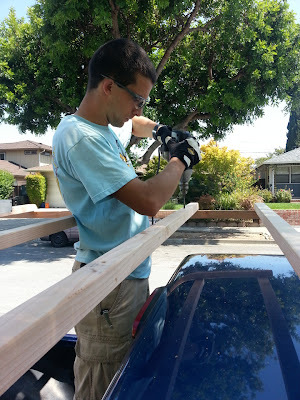 Here is Marcel drilling the mounting holes in the cross beams for our 100W solar panel, which is part of our camp's photovoltaic system, which I'll document later. Here is the truck with the entire frame built and deployed. 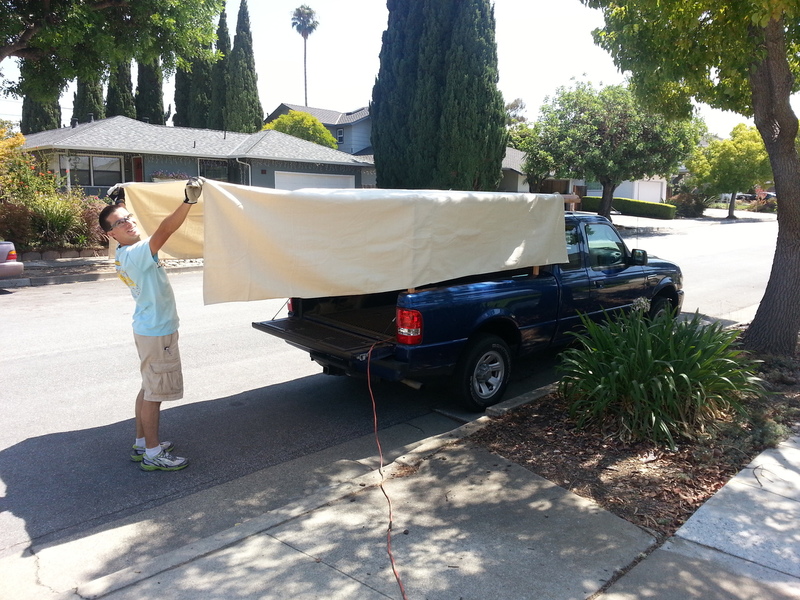 The awning behind the truck folds up on top for while we're driving, and will then be guyed down once we deploy the frame and staple a 12'x9' piece of heavy canvas to the frame on-site (as mocked-up in the first figure). One important thing to note about the awning, since it is physically referenced off the ground instead of the bed of the truck like the rest of the frame, is that there will be quite a bit of relative movement as we change the load on the truck's suspension. We used long 1/4-20 bolts, fender washers, and a pair of nuts on each joint to act as a pivot. We aren't going to install the canvas until we are on-site, so that we don't have to drive 80 with literally a giant sail on the back of my truck. 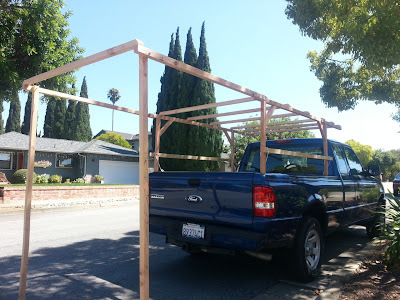 Hopefully this structure will hold up to the elements at Burning Man, otherwise we are going to find ourselves with a lot less shade than we were hoping for. For anyone else attending BM this year, the best way to find me will probably be calling me via amateur radio. 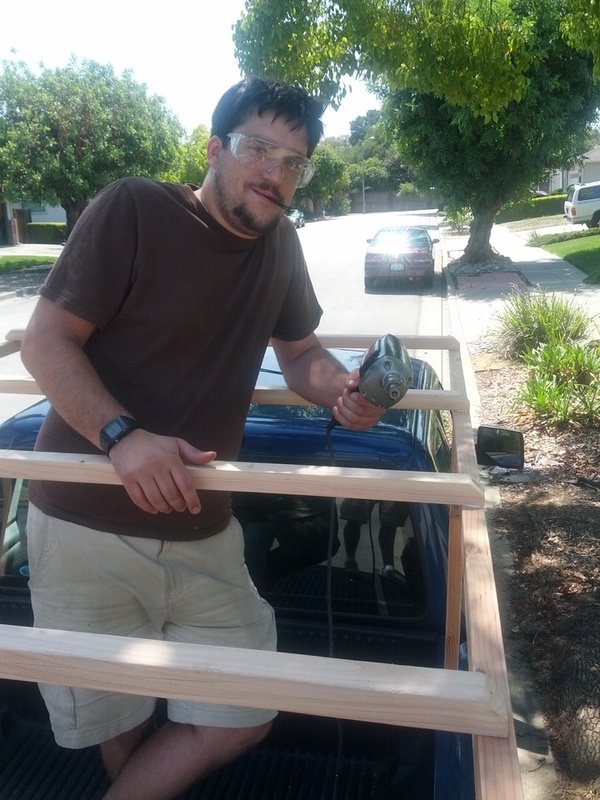 Marcel (AI6MS) and I (W6KWF) plan to be using 146.535MHz with a PL of 127.3Hz, so give me a call.